The BIObus is the field research vehicle of the Centre pour Biodiversité Genomiques (CBG), serving dual roles as both a mobile lab and as a flagship for learning and public engagement in biodiversity science. 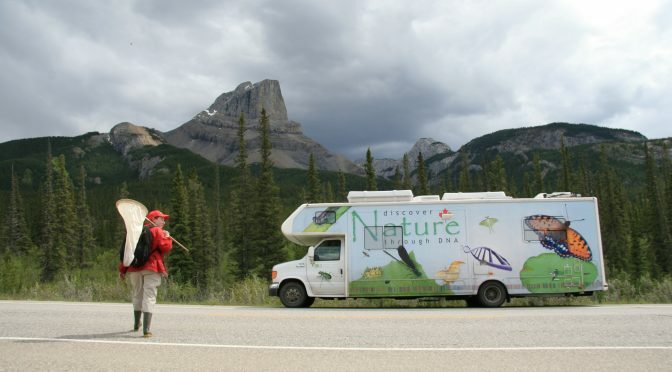 Since 2008, the BIObus has traveled across North America visiting biodiversity hotspots to collect insects and other invertebrates. The crew consists of 4 members at a time, a CBG field biologist with 3 undergraduate students. These young biodiversity scientists learn collecting methods, specimen preservation, taxonomy, how to work as a team and how to interact with the public. Plus they get to visit spectacular National Parks, provincial parks and conservation areas! Follow the crew’s journey on the BIObus by reading about their experiences in their weekly blogs. Also check out their Facebook and Twitter feeds. Discover: Why is Biodiversity Important?